We had a massive storm here in Sydney yesterday that wiped out our power, which is my excuse for being late to post this blog! The Lace Dynamic Textured Impressions Embossing Folder will be available from 3rd January in the Occasions Catalogue and it's a beauty! I used a watercolour pencil to gently colour the little embossed flowers and then smoothed the look with an aquapainter. I also added a little pearl in the centre of each flower. 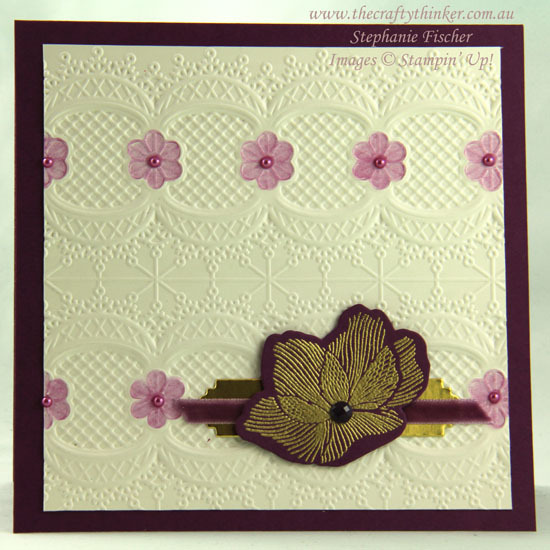 The larger flower is from the Beautiful Promenade stamp set. I gold heat embossed it on Rich Razzleberry cardstock (sorry the photo has come out a little dark). Having cut it out with the coordinating die from the Beautiful Layers Framelits, I placed a Faceted Dot into the centre.